The 1899-1902 Boer War was a protracted conflict between the British and the South African descendants of mostly Dutch settlers. Asymmetrical warfare, scorched earth policy, concentration camps and rapid fire technology kicked off the 20th century with the world’s first truly modern war. It was also the first overseas war New Zealand sent troops to. The Battle of Paardeberg, Sunday, February 18, 1900 by HW Wilson. From Arthur Conan Doyle’s The Great Boer War. Krupp Gun No. 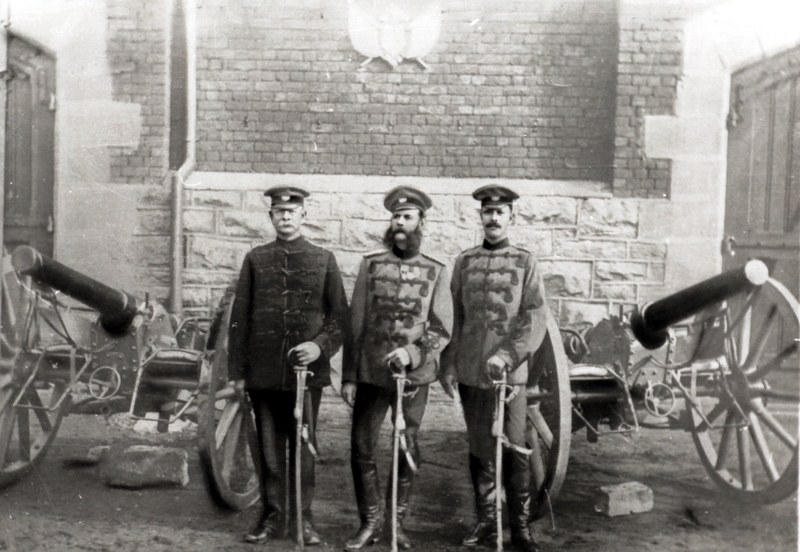 4 was captured on 27 February 1900 at Paardeberg Drift by the Modder River. General Piet Cronje’s 4000 men were trapped by heavy bombardment and out of artillery ammunition. 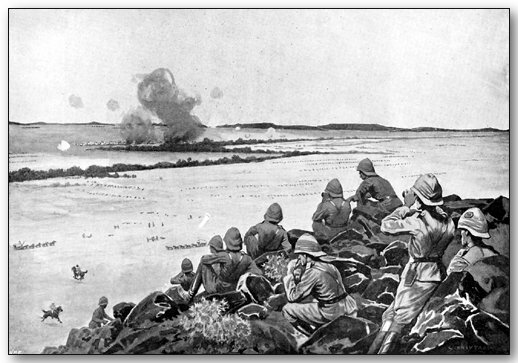 Cronje’s gunners removed the breech-blocks from their guns and threw them into the river. The Krupp gun captured at Paardeberg and gifted to New Zealand is number four of six numbered guns. The defeat at Paardeberg broke the Boer effort’s back. Later in the same year the British announced victory. Prematurely it turned out. The conflict was to continue for another two years as the Boers adopted a guerilla style of warfare. Krupp Gun No. 4, in the meantime, had been shipped to a rapturous reception in New Zealand. Picture from the Wanganui Story, 2nd edition. Smart, MJG, & AP Bates. (Wanganui Newspapers Ltd, 1973), plate 21. Alexander Library Wanganui. In Victorian times the war trophy was not an outmoded concept. The Krupp gun was proudly mounted at Wanganui’s South African War Memorial. Despite its pride of place in Wanganui’s South African War Memorial the gun suffered a number of ignominies over the following decades. 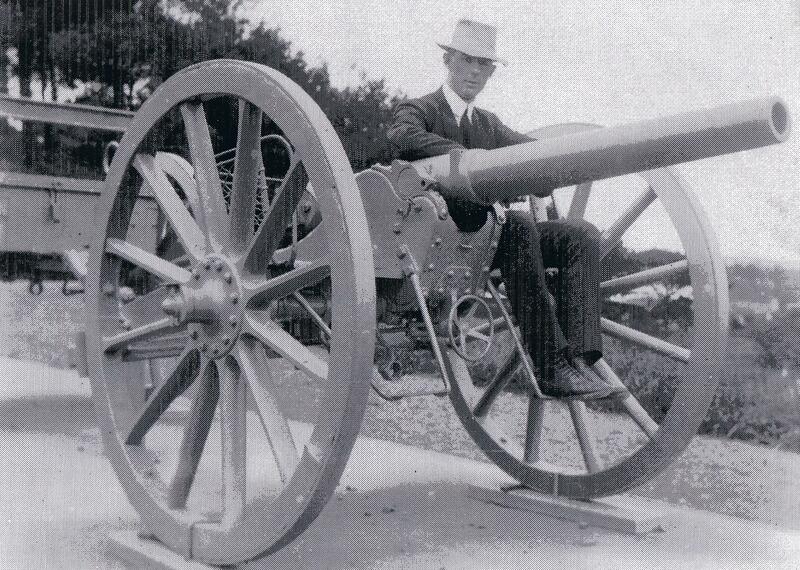 The limber, a detachable section of the gun carriage used for carrying ammunition, was lost during the 1920s or 30s. Shortly after the bombing of Pearl Harbour in 1941, Home Guard members buried the gun in Cooks Garden to conceal it from Japanese spotter planes. Dug up again in the 1950s the trophy was stripped, repainted and displayed outside the Army Headquarters. A tussle over ownership rights in the early 1970s saw the Krupp gun posted outside the Whanganui Regional Museum where it remained as little more than a relic from a long forgotten war. The Boer War relic was state-of-the-art when the Krupp Iron Works in Essen manufactured the weapons in 1892. The field cannons were exported to South Africa in the same year. By the 1930s,the gun’s spoked wooden wheels were had decayed and were replaced with concrete discs which incorporated the original hubs and steel tyres. By 2010, when antique armaments enthusiast Geoff Lawson took a closer look at the relic, the gun was badly rusted. He offered to restore it. The museum agreed and called in professional conservator Detlef Klein to oversee the project. German-born Klein had trained in cabinet-making, interior furnishings, building technology; the conservation of wooden objects and furniture. At the time of this interview in 2010, he was a lecturer in preventive conservation for the museum studies programme at Massey University. Klein is also Director of Manawatu Museum Services. He detailed the methodology, aim and costs of the work in a Conservation Plan. He outlined a meticulous framework. “The Wanganui Krupp Gun is considered a rare surviving example of its type. It is the only one known to exist in New Zealand. If a missing part had to be replicated, it should exactly match the original design. Lawson was initially taken aback by Klein’s uncompromising approach. He had experience in armament restoration – antique guns had fascinated him since childhood. He was used to working on vintage cars but he wasn’t as rigorous as Klein in his is stance on veracity. “The only thing you’re interested in is it’s finished correctly and that everything works like it’s supposed to do. If something’s more trouble to fix than it would be to make a new part, well, you make a new part. “But because this was a very historic item, we needed to do as perfect a restoration of it as we possibly could. Lawson loaded the gun onto the back of truck and took it to Ed Boyd’s auto workshop for restoration. His team dismantled the gun and labeled and photographed every component to help build a CAD (Computer Aided Design). The men also examined each part for original paint colours but found none. The gun had been repainted so many times, no original paint existed, they told Klein. Finding examples of the original specifications, including the colour scheme would be a challenge. The Krupp archives were destroyed during World War Two. No information from the now non-existent Krupp Iron Works was available. Also, only five reasonably complete guns of the same type as Krupp Gun No 4 were known to exist. All were compromised by the kind of restoration efforts Klein despaired of. Klein took a forensic approach to identifying the original colour scheme. He inspected the lowest part of the gun, the centre of the axle, and found several layers of paint there. “Every time the gun was repainted, the paint dripped at that point. And because it’s the lowest point no-one bothered to wipe it off. The innermost layer of dark blue grey matched Krupp factory colours while a light grey layer was in accord with Orange Free State (Boer) artillery colours. Klein saw the paint discovery as a turning point in his working relationship with Lawson’s team. More information about the gun came to light as each piece was sandblasted. Stamped serial numbers; the makers name, the gun’s identity number, the ghostmark of a brass plaque; the place and date of manufacture, appeared as old layers of paint were stripped away. Each mark and its location were catalogued. Screw heads, rivets and sections of rusting steel were stored in labelled containers. Rusted parts were repaired. Components too worn to be reused on the gun were recast. A wheelwright used the gun’s original bronze hubs and steel rims to calculate the wheel design and turned new wooden spokes and felloes, the outer rims of the wheels. Using photographs and technical specifications Lawson had a ten kilogram shell engineered from a piece of solid brass. Shells were mostly self-contained (like a modern cartridge) by 1892, and had switched from black powder technology to brass shell cased smokeless, nitro ammunition. The Boers preferred to load a bag of black powder separately with the shell. This was an old-fashioned method but the Boer’s mobile, civilian style of warfare meant it was more convenient for them to prepare their own gunpowder. The shell Lawson made was an exact replica of the original and fitted the gun barrel perfectly. “But there was one detail that no one knew what it was or why it was there,” says Klein. This was a cylindrical sleeve attached to the side of the gun carriage. From photographs of the same part on a Krupp gun in Canada, Lawson accurately calculated measurements for gun No. 4. From traces of felt inside the Canadian version he gauged the thickness of the cylinder’s lining and lined the same feature on the Wanganui gun with compressed felt. “He has a good eye for those kinds of things,” says Klein. The trouble was that neither man had any idea what the cylinder was for. Then Lawson had a eureka moment. Lawson’s eye for detail also helped him recreate the missing breech-block, the firing mechanism, the Boers had thrown into the river. Working from nineteenth century German field artillery manual drawings, he carved a wooden model. What he and Klein needed though was detailed information about the breech-block’s components. Then Klein discovered a photocopied image of a matching C73 Krupp gun barrel and breech in the Dresden Military Museum. The C73 Krupp gun barrel’s 75mm bore was etched with spiral grooves to enhance accuracy and it had a firing range of about six kilometres. The museum curator sent him detailed information. “He had taken the whole thing apart including the breech-block, laid it all out, and photographed it all with a measuring stick and description,” says Klein. Once again the restoration team was able to cast an exact replica in steel. To replicate the missing brake bar and brass plate, though, Lawson stepped outside the brief. He deduced the brake assembly’s design from two photographs of similar guns in South American collections. He enlarged the images and from them calculated the brass plate’s dimensions but he had to interpret part of the text. On Saturday, May 8, 2010, Mayor Michael Laws officially received the gun in a ceremony on the forecourt of Wanganui’s War Memorial Hall. The highlight of a parade of pipes and drums and civic delegation was the ritualised firing of the field cannon, the culmination of five years of hard work. The mayor bestowed a civic award on Lawson and his right-hand man Martin Emerson. Klein was disappointed at Lawson’s additions to the gun, and that it had been paraded and fired. The Conservation Plan had clearly stated that it would not be. But restoration of the feldkanone was clearly close to Klein’s heart. “I have fond memories of it and I’m pleased it went the way it did. I think that it still can stand as probably the most significant restoration of its type in the Southern hemisphere. “The thing is a massively superb job of not just restoration – but in terms of consistency of philosophy and approach, documentation and in terms of how a very disparate group of people from very different perspectives came together and made it happen. The Krupp gun is a national and military treasure, says Lawson. “The irony is that it was sitting here in Wanganui for more than 100 years and no one in New Zealand knew it existed. Krupp Gun No. 4 is now permanently installed in the foyer of Wanganui War Memorial Hall. 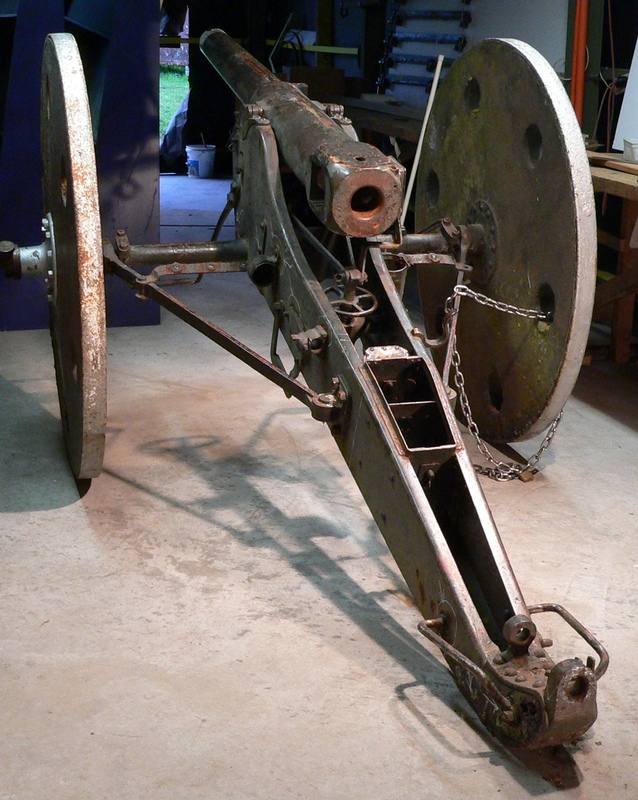 The field cannon is one of the few Krupp guns remaining in the world. It is the most faithfully restored and is the only one in working order.